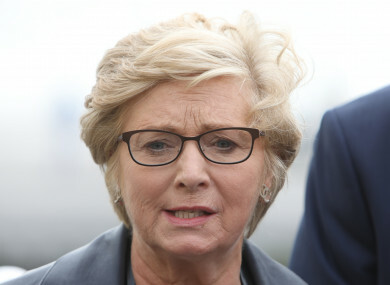 Poll: Would you be happy to see Frances Fitzgerald return as a minister? Frances Fitzgerald could be poised for a dramatic return to Cabinet. YESTERDAY WAS A seismic 24 hours of news for lots of different reasons. Between Storm Callum, the Charleton report, and the resignation of Denis Naughten as Minister for Communications, there was enough news in one day to fill a week. One quirky overlap of the latter two stories is the effect they have on former Justice Minister Frances Fitzgerald. In one fell swoop, she has been effectively exonerated with regard to her dealings with the case of Maurice McCabe (said dealings led to her resignation as minister last December) while at the same time a space has opened up at Cabinet. But should Fitzgerald get that job? Or is her reputation still sullied by her own resignation? We’re asking: Would you be happy to see Frances Fitzgerald return as a minister? Email “Poll: Would you be happy to see Frances Fitzgerald return as a minister?”. Feedback on “Poll: Would you be happy to see Frances Fitzgerald return as a minister?”.